Its been an amazing Autumn so far, seems its not rained for weeks, and with daytime temperatures sometimes up around July temperatures, its meant that its been great for the late rush of Insects. We have had one noted frost. 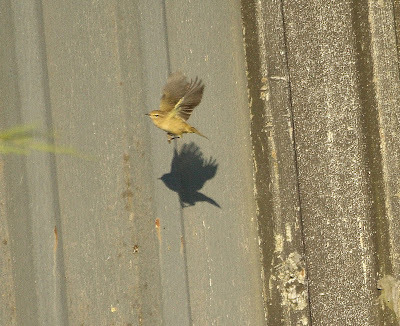 Chiffchaffs, Willow Warblers, Blackcaps have been flocking through the local Woods, with good numbers at Portbury as well, this as they move south towards Africa. Sadly though here at Portbury they have cut back what seems to be a huge amount of vegetation meaning that all the rough grass with the exception of the ditch edges is now gone. 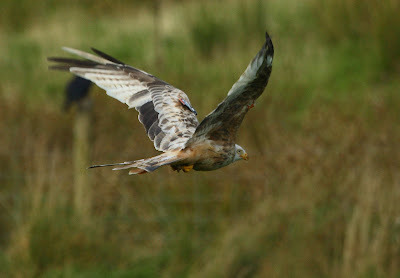 Its a bad time to cut grass as there is no time left for the grass to recover and therefore hold any preyable population of Short-tailed Voles for the Barn Owls. Also gone is most of the seed head plants, which prior to the cut I had counted a mixed flock of Finches numbering as an estimate over 200 birds including Goldfinch and Linnets, well they will have to find somewhere else now. 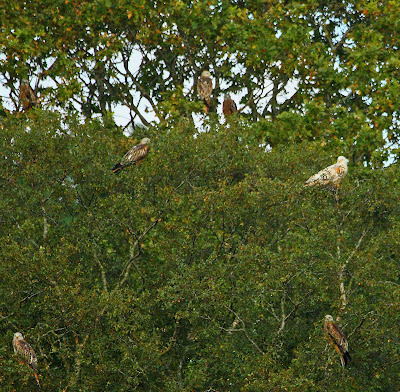 No I'm not talking about farmland I'm talking about a nature reserve! 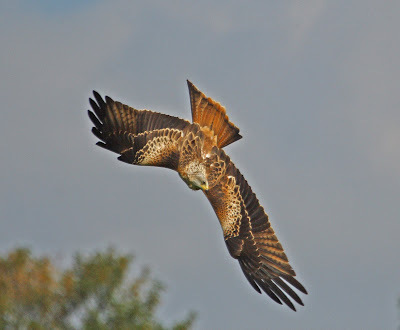 Meanwhile I have started bird surveying on the Hawk and Owl Trust nature reserve called Shapwick Moor, with great thanks to Eve Tigwell (BTO rep Somerset) and Dr. John Edwards Hawk and Owl Trust Trustee for their help with this process. As I have only just started there's nothing much to report back on yet, however I was walking down the side of one hedge when a Brown Hare appeared right in front of me. I carefully crouched down using the background of sprawling Willow tree to shield myself and took about 150 pictures, and here's one. 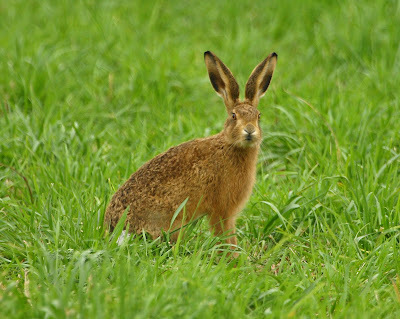 What was really good was that the Hare had not noticed me, and fed for a while on the green grass, then returned back into the cover of an un cut and rough grassy margin were upon it simply disappeared. Here's yet another declining UK animal that needs a much more untidy landscape, the proof of that was in the observation. 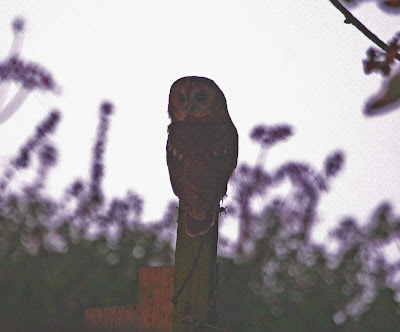 I have been monitoring the 2nd Tawny Owl release, which so far has gone really well, here are 2 pictures from last Saturday nights monitoring session when I found this one actually hunting on a grass verge within 100 metres of the release aviary. I should state now before I get e mails from perfectionist photographers that these pictures were taken with the ISO cranked up to 3200 on eos 30D hence the grain (it was virtually dark). However for me they more than works of art, they are my proof that Owls I have put out are hunting and therefore self supporting. 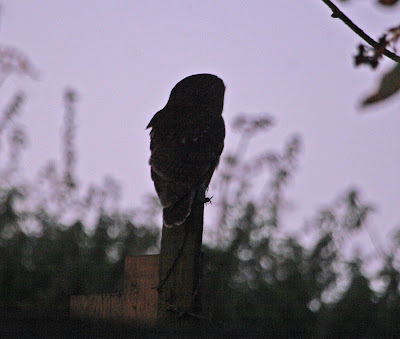 First picture is the Owl looking into the verge clearly hunting typical Tawny owl fashion, this Owl is now so reliable a film crew could film it (hint). By pellet returns its taking Wood Mouse and Brown Rat. 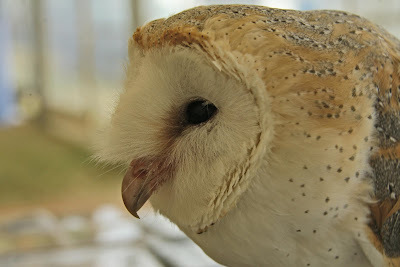 Same Owl, however it hears the click from the shutter of the camera going off, and turns to look. 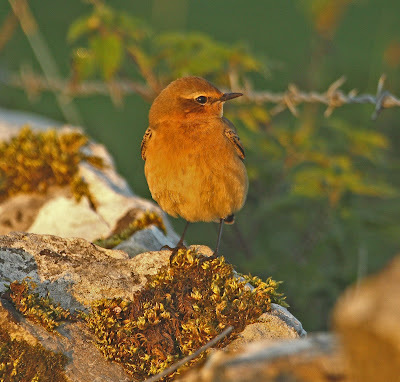 Meanwhile back on Mendip Wheaters have also been in good number on one farm (thanks again Paula) we had I reckon some 20 individuals suddenly come to ground just before sunset, picture below is one of them taking during the red phase of sunset, a bold youngster which was really close, and made me fire off another 150 pictures. 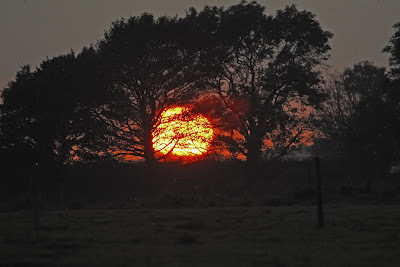 And lastly I could not leave this Autumn blog without a look at the sunsets, some of them have been the best for along time, here's a picture from Mendip on last Saturday night, a scene that makes you feel good to be alive. New video to come, Hornets very active, filming now! Thanks to Gaina for the idea to use video as a way of gaining better insight to what the Hornets are doing with the Hops plant. The first part its optical zoom, then it goes to digital zoom. The camera used is a Canon PowerShot SX200 this is a stills camera with built in video, so don't expect broadcast quality. Watch for the Ant part way through, who walks by the Hornet who in tun appears to lift its leg to let the Ant go by. Keep the support for Hornets coming! Footage taken 26.09.09 at 1000hrs, dull here in North Somerset at the moment, though mild not cold, so fair amount of Hornet activity in the garden. 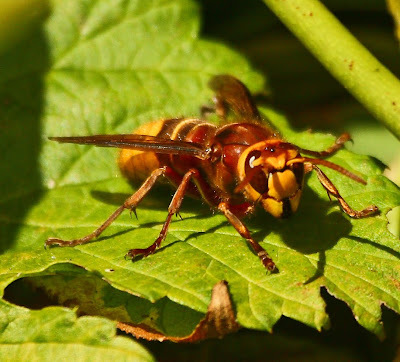 Many of you will remember that last year I followed and blogged about a nest of Hornets in my local woods. Well despite many searches for Hornets and nests this summer by both Dave Newton and myself both drew a blank, it seemed that 09 was not going to be a good year for them. As I walked through my drive to my house just today, I had that funny feeling I was being watched. I turned my eyes to my left looking now straight into a shrub that I had planted for the insects, and there was a familiar and very welcome set of large eyes looking back at me. The Hornets have come to me! 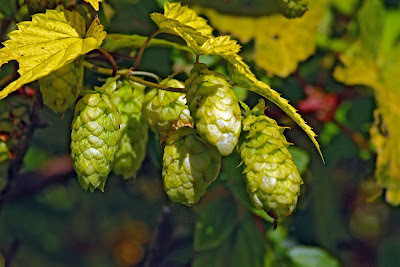 A group of between 10/20 Hornets were coming and going into this bushy plant in my garden, which in fact is a variety of Hops, here is a picture of the plant. I thought quite wrongly, that they were catching the many small insects which were all around the plant, however this was a completely wrong analysis. 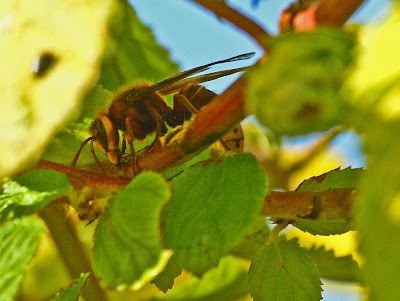 I watched closely as a small Bee was ignored by three of the Hornets which were all crawling over the same branch. Other insects were treated as though they were not really there. The only exception occurred after about 15 minutes of observation, this was when a lone Common Wasp landed on a leaf below the main Hops branch. 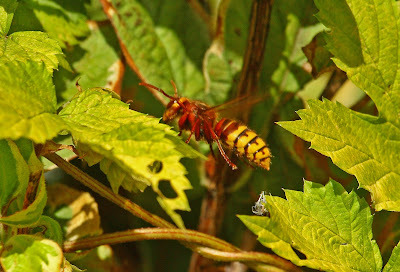 This was not tolerated, as 0ne of the Hornet's, which made the Wasp look minute, caught it very quickly and snapped it in half with its jaws, but then returned to the job it was doing before, and so it did not fly off with the body of the Wasp. This observation helped me to understand what was really happening, and so it seems to me that this was a particular group of female workers assigned to a specific job. 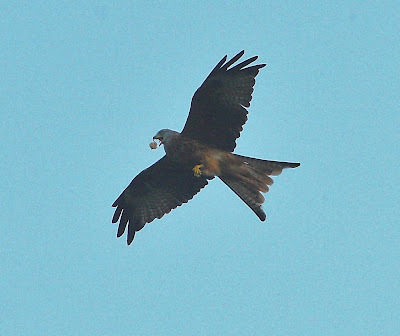 In fact they were collecting something from the shrub and then flying off towards a nest? Maybe the camera reveals what they are all up to. 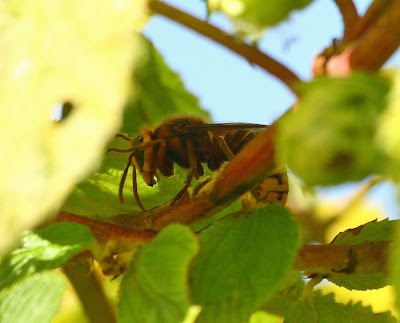 Poor picture, I know, but you can make out that the Hornet is stripping the outer layers of the branch from the Hops plant, after which it collects it in its jaws then fly off. This must be for re lining or construction material for the nest, however I do wonder if the Hops plant has some other special properties? (Anyone know, let me know please) O.K, anyone who thinks they are brewing beer can leave now. Just as last year, I never once worried about how close I got to the Hornets, indeed on several occasions I actually stuck my whole face into the bush to watch what they were up to, and not once did they behave in a threatening manner, even though my ear was touch on at least one occasion. Health and Safety Caution Note: Don't do as I do. I feel so privileged to be able to get so close, and hopefully to understand a little more about this wonderful insect, which throughout my youth was non existent in my area. Now hopefully it will become more common. I was told recently we should kill them on sight as the sting is so nasty. No doubt the sting is very nasty, yet I have been very close to individual Hornets and even sat at the entrance of a nest as you will recall from the blogs of 08. I have been thoroughly analysed by the nest guards, and I have been buzzed just today by female workers, I sense no real aggression from them. Actually today it felt like I was being inspected, but it seems their assigned duty far out way any aggressive tendency's they may have. Their own conclusion appears to be that, I'm no threat, or maybe they don't want the hassle? I find them placid but no doubt if you re intention towards them is not respect then thier atttude towards you might be different. Tolerating species whether they bite, sting, kill other animals is I feel, very much apart of being closer to the nature that surrounds us. If we become closer to it, then just maybe we are understanding a little bit about even ourselves. Many thanks to all those that have sent comments about the programme last night. What is heartening is that 2 different people mentioned they would never call Herring Gull pest again, as I have always said today's pest species can easily be tomorrows scarcity, and how many species is that happening with at the moment, and yes I do mean here in the U.K. So sorry to hear from those of you who missed the programme, well for a short period at least you can listen again to the programme at this website http://feeds.bbc.co.uk/programmes/b00mkbys so no excuses now. Mary is a top Radio and TV producer as you can see by all the awards she has won, I just do the talking. This wonderful camcorder the quality of which you can be seen if you go to you tube and just write the model name into the search bar. This is a reluctant for sale, reason for sale is simply lack of time to use it. I will be putting the camcorder out for general sale in the next few days, however if anyone is interested let me know, it is hardly used. 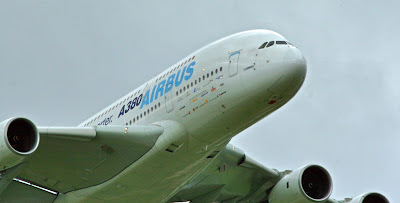 A request from Airbus to participate in the family air day at Broughton near Chester, and a great chance to talk with thousands of people about nature conservation, bio diversity and climate change. This was too good to miss. It was also great to be able help Airbus push their brilliant photographic competition aimed at young people and linking up with the U.N biodiversity green wave project http://greenwave.cbd.int/ Beau the barn Owl came with me, yes to an air base and she loved it! Of course she is well known at RNAS Yeovilton as we both perform beat the military pilot as she puts her skills and those of her colleagues against the best pilots in the world and the public gets to vote on whether the birds or pilots are best. Of course Beau and her friends always win the public vote, but there again you can't beat nature, only closely mimic it. So as guest of Airbus Beau (the Barn Owl) and I were taken into the factory area, were we saw the A380 wings stored. I'm sure at one point Beau said something like "call that a wing" just then one of the organisers explained something that was really fascinating and that was, here was a real Barn Owl looking down the wing of an A380 and this wing was modeled on an Owls wing this to reduce noise and so also gaining greater efficiency. Now that was a big wow! If you have never looked down one of these wings then they are enormous! I was told that at the end that joins on to the plane, it is so big that 2 full grown men stood on top of each other could walk around inside. Whilst in the factory area I was introduced to Joel Sartore National Geographic Photographer (oh my god) Thinks I. "Am I not ready for this". I'm sure you would have all loved to have been flies on the wall watching this one. There was I with a Barn Owl in one hand and a Canon EOS 30D round my neck telling everyone "hey, yea I can take pictures with this" Then they bring out the KING of photo journalism, and oh no not just the KING, but the KING with a Camera round his neck, and his is so big and shiny, so much so that my poor old Canon EOS 30D just whimpered away into the background like a limp floppy camera. Seriously folks, Joel was every bit the pro you would expect and said the 30D was great in its day. (Canon, if you are reading this then please HELP!) You all must go and see Joel's pictures, regular viewers or readers of Nat Geo will be very familiar with his work. Joel's very important message which he delivered during the Airbus day was full of his own personal experience whilst on assignment for Nat Geo. The message is all the more stronger when someone sees at first hand species declining, or species on the brink, and the pure affect of climate change on wildlife and people. I suppose this is much the same as myself but with me its only on a UK scale. After meeting Joel and having a really good chat about life, the Earth and how not to use a camera, the good people of Airbus dumped me big time into the deep end as I had to go up unprepared and give a 5 minute talk in front of a huge crowd of people. OK I did it, I desperately wanted to give out the message about the UK, about what people can do here. About species that were, and or could go on the brink, and no not in Africa, or India or even South America, but here in the UK. I really think the Airbus UN competition is a great way to get younger people involved and thinking on a bio-diversity scale, and if any of those attending are now looking at this blog, then remember that wildlife conservation can indeed start in your garden, and if you have not got one of those, than how about the bio diversity of window box, even the now amber listed (25% decline) Common Kestrel can nest in them, in other words anything is possible, but for goodness sake everyone do something. 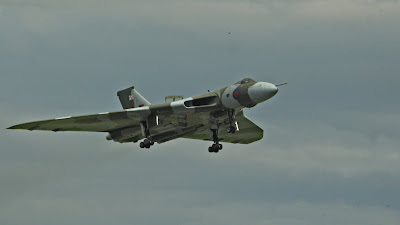 During the afternoon Beau and I retreated back to the open day and met the public flocking in for the air display. 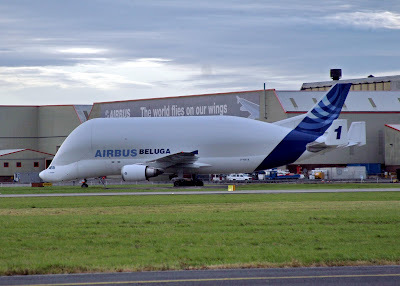 In between talking to hundreds of people about nature conservation in the UK and the brilliant work of the Hawk and Owl Trust http://www.hawkandowl.org/ I did see something of the planes, though we spent most of time inside on the Hawk and Owl Trust Stand.Below is the Airbus Beluga, which I did not see fly as I was on the HOT stall. In the morning however I did see it load new wings into its belly. This plane always reminds me of what a pregnant plane ought to look like. 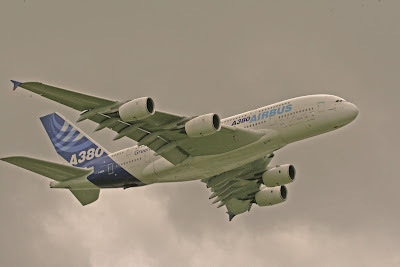 Then there was the huge but very quiet Airbus A380, as the A380 arrived over the run way it just seemed to fly so slowly and effortlessly, and yes just like an owl. View below is a full view flying over the runway, with the next picture zoomed onto the front a few seconds later. Also flying today was the rarest bird in the world, and a plane I remember from my youth, the silhouette below is a shape that brings back so many memories, not just the shape but also the sound. I would be playing as a small boy in my parents garden in Portishead and from the top of the garden I could see across towards what looked like three small mounds in the extreme distance, this was the hangers of the runway at Filton airport, from this direction would come this V shaped monster of a plane. 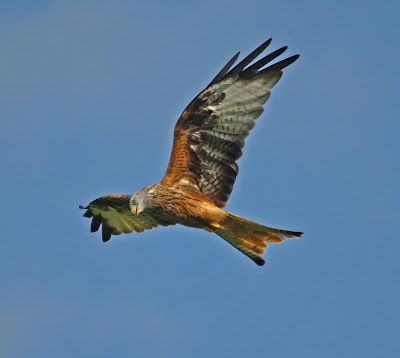 When it flew low over the house (or so it seemed) it would suddenly point its nose into the air and thrust up into the sky over my garden, making me run for cover, the ground shake and send Dogs howling and hiding for months. 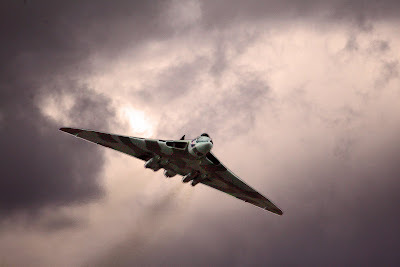 This was of course the magnificent Vulcan Bomber, which at this time of my life was testing what would become the Concorde engines, so seeing this magnificent bird again really did bring back a lot of memories. 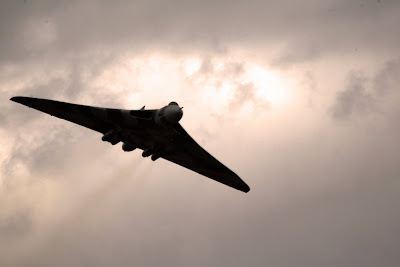 As it passed low over the Broughton runway it did suddenly tip its nose up and thrusted up, and that familiar crackling of pure real power could be heard and even a slight shake of the ground as well, not just my hair stood up when that happened but around 20 000 other peoples hair was raising as well. 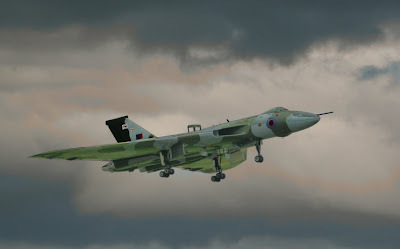 Here is one more picture of the Vulcan, sorry they are only taken with EOS 30D, maybe its time upgrade. Thanks to everyone at Airbus for making this a great day, full of good messages great people as well, thanks also to the people of Broughton for making a Somerset lad very welcome. Hopefully see everyone next September in Filton. Aviation and nature conservation, you see folks were there is the will, then the way will be found.